Government Digital Strategy - Digital By Default - Gary Ling, Digital Producer, Data Monetiser, Political Savant, Information Economist, Solution Seller, Business Strategist. 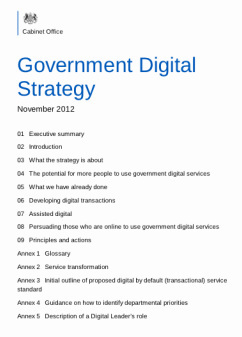 Posted 10 Dec 2013: Just over a year ago the UK Government's Digital Service (GDS) published its digital strategy. This strategy has become known as "Digital by Default” (DbD) and for several reasons looks like being one of the most transformational government programmes since the publication of the Northcote-Trevelyan Report and the creation of UK Civil Service in 1850. For a start, the strategy paper defining this programme is remarkably well written. It has seven key components, such as: Increasing the number of people who use digital services; Broadening the range of those tendering to supply digital services including more small and medium sized enterprises (SMEs); Removing unnecessary legislative barriers; Basing service decisions on accurate and timely management information; and Improving the way that the government makes policy and communicates with people. Redesigning transactional services to meet a new digital by default service standard; and, increasing the number of people who use digital services. These principles provide an important foundation on which to translate policy and intention in this area. It also sets out a very real, practical checklist of fourteen specific 'Actions' that central government initially (and local government in time) will follow to bring the Digital By Default strategy to life. 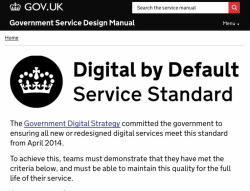 What's more, in the past year, the GDS has managed to convince Cabinet ministers to put Digital By Default at the heart of public service provision in their departments. This means that digital services that are so straightforward and convenient that all those who can use them will choose to do so, whilst those who can’t are not excluded. The GDS estimates that this strategy of moving services offline to digital channels will save the UK taxpayer between £1.7 - £1.8 billion a year and plans to move 650 transactional services that the government provides to online mode. All of this means, that DbD will impact every citizen who uses public services. Just as people increasingly use digital devices (PCs, Tablets, smartphones) to organise their lives, shop and seek information government services will be delivered in this way too. On an almost daily basis, the GDS publishes blog updates on how it is doing in meeting the principles and actions outlined in the DbD strategy paper. This in of itself is a startling departure to the ways that government has worked in the past. More significantly perhaps is that these updates are written by people close to ground in implementing the tactical measures that bring DbD to life across government. It is noticeable that the images that accompany these blog posts are mainly of younger people fully engaged in the process of rolling out DbD, dressed more informally that you might expect from historic dealings that more experienced people might have had when they interacted with representatives of the Civil Service. What comes across is a 'collegiate atmosphere' where everyone's view is listened to, if they take the trouble to coherently think about how they can add value to the success of DbD. 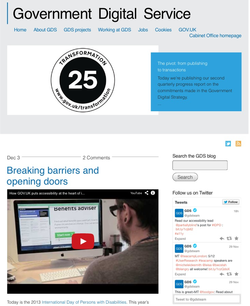 In April 2013, the GDS published its Government Service Design Manual for digital services. This is the implementation standard that government departments must adhere to when they digitise the Big Data transactional services that they offer to the general public (immigration processing, issuing driving licenses etc). This document lays down Twenty-four 'criteria' for the DbD Service standard. Arguably, the 'DbD Service Standard' will be the component that has the greatest impact on transforming Britain. Just like the formation of a 'modern' and dedicated cadre of 'professional administrators' dedicated to public service, widespread implementation of the DbD Service Standard will have a massive effect on everything that the government does. To have set out the strategy, principles for implementation, tactical plan and already have had some serious success in rolling out DbD must be recognised as a big achievement for the GDS in its first year or so. However, the true impact of DbD is yet to be felt at both the front line of public service delivery and also in making improvements in the way that government makes policy and communicates with people. To be successful here the GDS needs to alter its approach in two areas and speed up its plans to remove 'legislative barriers' that restrict DbD helping policymakers deploy even more effective online public sector services. Open Source. The first area for 'revisitation' is the GDS policy of pushing 'open source' software as part of it's 'open standards' agenda (confusion between the two in government circles is rife). Open source software may have a major role to play in the success of DbD but the message to those who have to implement digital projects in the public sector is too skewed towards this type of software as opposed to the propietary software vendors (SAP, Microsoft, Oracle etc) who have traditionally served the UK Government. The irony here is that the UK public sector is crucially dependent on these vendors (try installing Open Office in your department and see how far you get). Asking project managers to have to justify using these vendors as opposed to open source is a wasteful exercise that may not get best value for money for the taxpayer. Lessons should be learned from the fact the US Affordable Healthcare ('Obamacare') website is a recent example of where there was an emphasis on government using Open Source over proprietary software. SMEs. Second, as a part of government procurement, SME participation is being pushed very heavily. This is rightly a noble aim but should not clog up senior management time and become a politicised issue for constituency MPs trying to curry favour with small firms in their marginal constituencies (see the video example below). Data Sharing. Lastly and most significantly, the issue of data privacy restrictions on decision makers analysing data for policymaking purposes needs to be addressed. At present, it seems that many departments, councils and agencies across government are wary of even using and sharing anonymised aggregated data. Such sharing would transform the ability of the public sector to provide really targeted and useful services. Legislative restrictions on how data can be used and shared between UK government departments, local authorities and agencies, which are in turn often misinterpreted by data security officers on the ground, are one of the biggest issues that the UK faces in getting close to the ‘joined up thinking’ that the GDS in its DbD initiative is trying to encourage and support. The Digital By Default strategy alludes to this in some way when it says the Government Digital Service will : "Remove unnecessary legislative barriers. The GDS needs to outline exactly how they are going to tackle this given a busy legislative timetable for the Coalition. Does Cabinet Office Minister, Francis Maude, have the political ‘pull’ to be able to table a bill that brings the whole government into line, from a data protection point of view, with what is required to make UK public sector digital services truly fit for purpose, cost effective and highly targeted? Or will we see a sub-optimal, piecemeal legislative effort where such changes are hacked onto bills that only affect individual departments and functions? When the GDS can tell us this it will mean that they have truly recognised that Digital By Default is a lot more than data standards, procurement changes, technological innovation and User testing. It’s really about transforming how individuals perceive the return they get on sharing the marks of their digital footprints. Priceless viewing: This (4.5 min) video of action at the 25 Nov 2013 "Managing Government Suppliers", Public Affairs Committee grilling Bill Crothers, Chief Procurement Officer, and Stephen Foster COO Procurement (both Cabinet Office) is a remarkable example of the effect of the developments you can read about on this page. It starts with the MP for Daventry trying to find out why a small business in his constituency called 'Mapsite' can't win a contract with the police. The response from the officials is priceless and we get to see the pressure that DbD (Digital Services Framework) and Civil Service Reform is having on our Mandarins. The days of 'Yes MInister' are long gone! "Don't Be A Follower. Be A Thinker at www.ThinkSURE.com"